Researchers at the University of Tokyo‘s Kamata lab are working on a new wheeled robotic vehicle that can climb stairs. Called the NOBOROT, it uses a proximity sensor to detect when it is next to a step and is able to maintain a level posture while ascending and descending to ensure a smooth ride. JTEKT (a Japanese company owned by Toyota Group that specializes in auto parts and machine tools) demonstrated the stair-climbing prototype over the past few days at the 26th Japan International Machine Tool Fair (JIMTOF 2012). 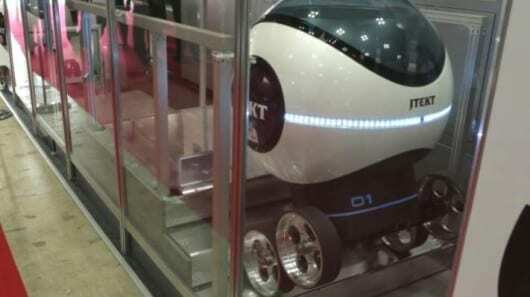 Combining the company’s latest innovations in electric power steering, control, and sensors, the NOBOROT is able to climb stairs by fully revolving its front and rear wheels as a pair, switching their positions in the process. It stays upright with an inverted pendulum control model and uses high-torque actuators that work to keep the vehicle steady at all times. The technology may find success in Japan, which has the highest percentage of elderly citizens (20 percent are over the age of 65 today) per head of population. The company says the the technology could find its way into electric wheelchairs by 2017 and also has potential for industrial and rescue applications.